Of course don´t forget that as much as you may be attached to a specific leather belt of yours and keep on wearing it, there will always be a new deal to raise excitement. So, if you are looking for the best leather belt for men, these are some of the top reviewed leather belts we have liked and chosen for you. 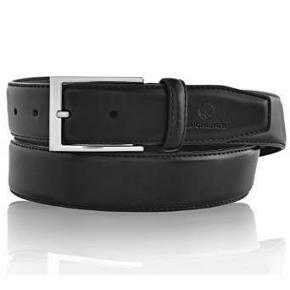 The Dockers Men’s Leather Belt is bevel edged and made of 100% leather. It is 2″ high and available in sizes 32 to 44. There are some mixed reviews about the size, somepeople find it a bit short and others say it is a perfect fit. However, it is advisable to go for one size up. It comes in black and dark brown, like a mahogany shade which looks nice. The leather finishing is hard which some people don´t like but the majority says it feels good. 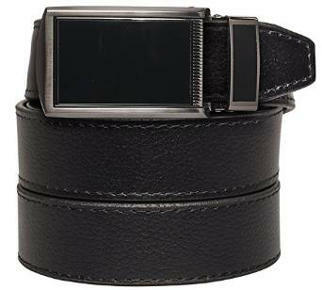 This Levi’s Men’s Belt is reversible with an elegant looking gunmetal buckle. The strap width is 40mm which looks nice on all types of pants and particularly jeans. It is hand washable which makes it convenient to keep it clean and it is also reversible with black and brown color which makes it very useful especially when you are traveling so you don´t have to carry two belts. The company recommends that you should buy one size larger. I understand that this would solve the size issue but I don´t understand why the manufacturers don´t just make them to the right size instead of telling us to buy a bigger size. 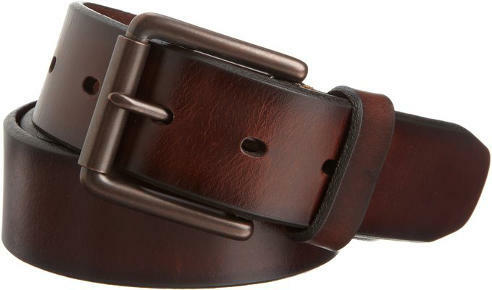 The Carhartt Men’s Anvil Leather Belt comes in full-grain bridle leather and for me it looks a lot more attractive in brown with that shading effect. The black looks nice, too but not quite the same as the brown. 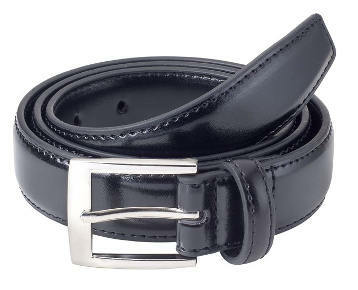 The belt is 1.5″ wide, which is a good size for all types of pants, and is available in sizes 34 to 46. It also has a great looking buckle in gun metal finish. Carhartt´s quality is well known to us and although it is a fraction high in price, you won´t be disappointed with its finish and quality. The Dickies Men´s Leather Belt is finished with a double row stitch which gives it a nice finish.The Dickie’s brand name is known for their work wear and their products are built to last. This belt lives up to the Dickie’s name and the extra stitching gives a nice touch of style. It is 1.5″ wide and the company recommends to buy two sizes bigger. As one user has suggested, in order to get a perfect fit, take your pant size and add 2 inches. This belt can also be easily washed by hand using a damp cloth. 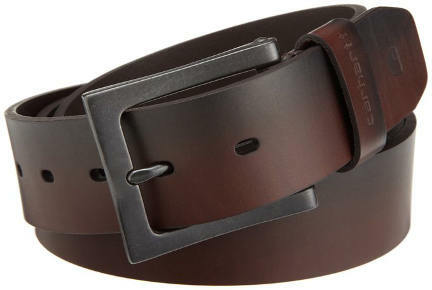 The Tommy Hilfiger Men’s Leather Belt is a great looking and elegant belt. It is extremely popular and gets some great reviews. A very useful feature is that it is reversible with black and brown color. It also has a single-prong smart looking buckle which adds to its elegance. It comes in 7 sizes, ranging from 32 to 44. 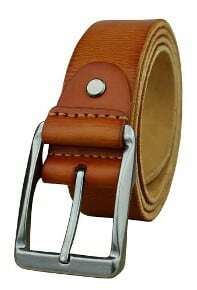 The belt is manufactured using 45% Cowhide Leather and 55% PU Bonded Leather. The cowhide tends to be hard which gives the belt a not so soft feel. Few users were not happy with its quality and managed to get it replaced. The BS-40 Vintage Full Grain Belt gets some great reviews. It is 1 1/2″ wide with a snap on belt strap and you get a choice of 4 colors. Burgundy is my favorite which can be matched with many shades of pants. It is made out of one piece of thick real Cowhide, which gives it a look of those belts made in 60’s or 70’s, and it is more suitable for an informal wear. You should also keep in mind that the Cowhide makes it a heavyweight belt. Overall, I came across some mixed reviews relating to the size with some people saying that it fits true to size and others suggesting to buy 2″ above your waist size. 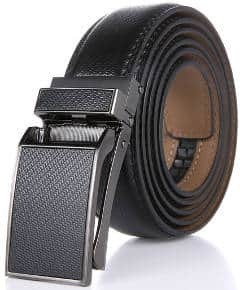 The Belt for Men 100% Genuine Leather Belt is a very economically priced belt and gets above average reviews.It is a100% genuine leather belt and has a width of 1.4 inches. The manufacturers recommend to buy a bigger size and trim it to size after you receive it. In the package, you will also receive a metal belt hole puncher which is a useful tool to make it into a custom fit. Also, the company offers a 2 year Limited Warranty for this belt. 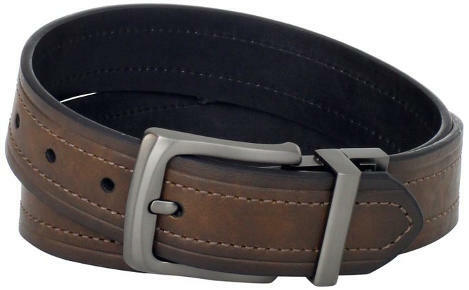 This Timberland Men’s Leather Belt is made of 100% Genuine Leather and is available in brown and black. Brown is more like a light tan shade which is great for jeans as well as formal wear. The width is 1 1/2 inches.In the picture it also appears to have a rough feel but the leather has a good feel and is not hard at all. You should order the belt size which is 2 inches above your waist size and it should fit nicely. The Sportoli™ Men´s Genuine Leather Belt is made of high quality leather with fine edge stitching. It will serve you both for casual and formal look.The width of the belt varies between 1″ to 1 1/4″, depending on the size. It is available in 5 attractive colors and a wide range of sizes between 28 to 60. You must also make sure to order one size bigger than your waistline. It comes at a great price and seeing the quality of the belt, it makes a good deal. 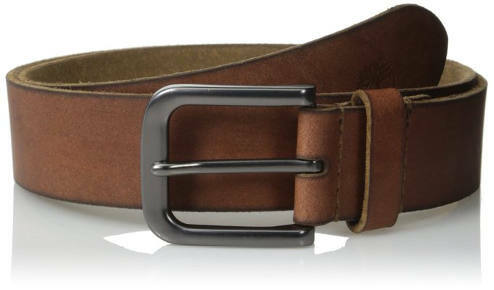 The Timberland Men’s Classic Jean Belt is another inexpensive and quality product from Timberland. It is 100% leather and should only be dry cleaned to maintain its finish and quality. It is available in black and brown colors. There is a good choice of sizes, 32 to 42, so you should not have any problem finding your size. As always, go for a size bigger. 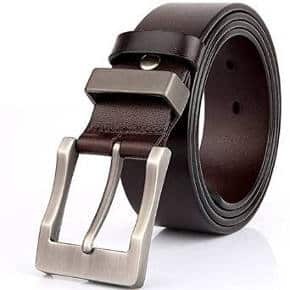 This belt gets above average reviews by the users. One very interesting observation by a buyer I came across was that you should keep in mind that the leather is single layer and thin, so it will stretch after constant use. 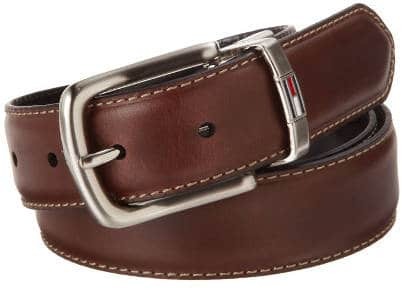 This Marino Men’s Genuine Leather Ratchet Dress Belt is one of my favorites especially because it does not require any holes. It is so annoying when one has to loosen up the belt after a heavy meal and the hole is either too loose or too tight. 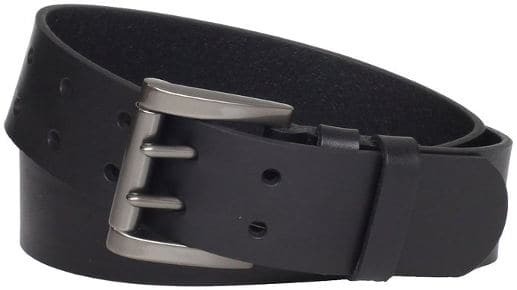 The easily removable buckle allows you to cut the belt to your ideal size and it is available in a wide variety of colors and choice of buckles. It comes with an elegant gift box and makes a great quality gift. The company is so confident about their product that they offer 45 days free exchange and returns plus 180 days warranty. 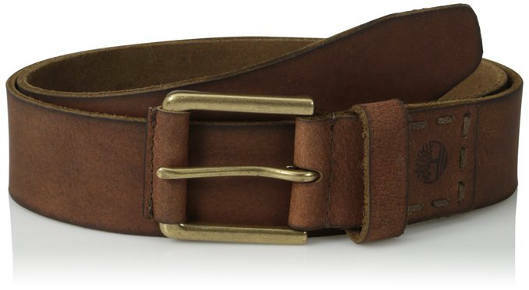 The Heepliday Men’s Soft Leather Belt is a genuine Leather belt with 1.5″ width. It has a smooth soft leather feel and looks quite sophisticated. The buckle dimensions are: Long 2.8inch/7cm and Wide 2inch/5.2cm. The buckles are available in silver and gold. There is also a good choice of colors depending on your preference. The company gives you some basic maintenance tips for a long lasting use and quality. The important area to be careful with is to keep the buckle dry and never wash with detergents containing chemicals. 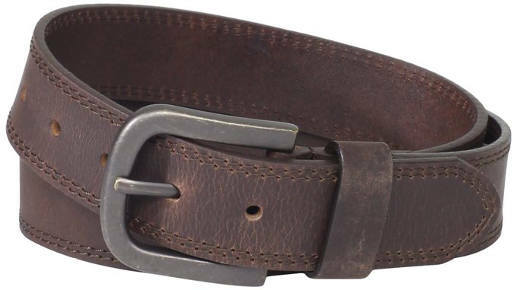 The Vbiger Men’s Leather Belt is another product which does not require any holes. What is particularly impressive here is the wide choice of buckles. There areplenty of options to choose for casual or formal wear.It is made of cow split leather and has an alloy buckle which makes it resistant to rust. The belt itself comes in different texture finishes. So, considering the great price, it appears to be a great deal. It also gets fantastic reviews with lots of satisfied customers. 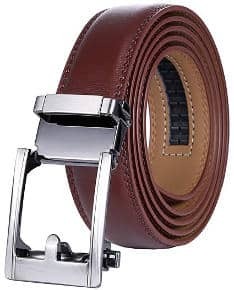 This Marino Men’s Genuine Leather Ratchet Dress Belt is another “No More Holes” product which has an easy removable buckle that allows you to cut the belt to your ideal size. The Linxx Buckleis the new innovative effortless solution. Just lift the buckle to release it, slide the belt in to tighten and the belt auto locks. It is available at a good price considering the quality and style, and the reviews it gets are great. The product also comes with 45 days free exchange and returns, plus a 180 day warranty. 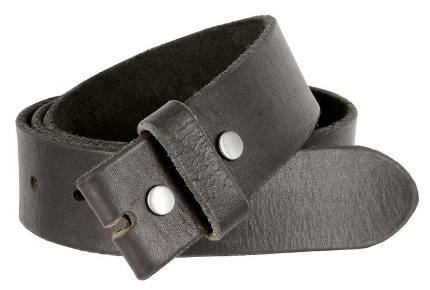 This Levi’s Men’s Belt is a genuine leather belt with a polished-gunmetal double-prong buckle. Its width is approx.40 mm, about 1.5 inches. It is of high quality leather and has the Levi’s iconic stamp. The belt is backed up by the brand Levi´s so you can´t go wrong with the quality and after sale service.It was also nice to see comments of users appreciating its quality even after 8 years of use. With such quality at this price, this is another recommended product. 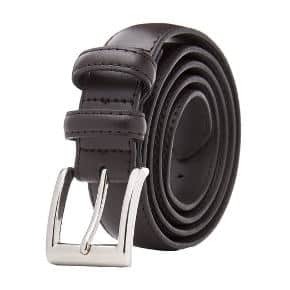 The Men’s Classic Dress Leather Belt is of 100% Genuine Leather and you have three styles to choose from, with different combinations of belt and buckles. The width of the belt is 30 mm which is about 1.2 inches.It is available in sizes 32 to 60, so every man can find their correct size. You just have to make sure to choose the right size.As a rule of thumb, your belt size needs to be approximately 2 inches bigger than your actual waist size. This belt is a high quality product and extremely durable to last you years of use. The LUCHENGYI Belt for Men has a sleek design and is ideal for casual as well as formal use.It is strong, yet lightweight and made of high quality durable genuine leather. The buckle is a basic classic buckle without Nickel. The stitching on the edges gives it an elegant look and there is an embossed, circular logo at the very tip of the belt to add a little touch of style. It comes in a really nice gift tinwhich can make a great present for men. Overall, this belt gets really fantastic reviews and the price makes it a real bargain. 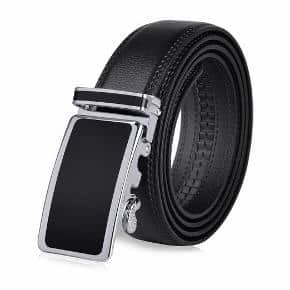 The SlideBelts Men’s Black Buckle Leather Belt, available in some unusual and attractive colors which you won´t generally find in belts, is certainly not a low price product but it´s really worth considering. It does not need any holes so you can adjust precisely to the perfect fit.It has a sleek buckle and the quality leather gives a great finishing touch to your style. Each belt fits up to a 44″ waist. The leather straps are 1-1/4″ wide and the buckles are 1-5/8″ wide x 3-1/2″ long. This product gets fantastic reviews and a lot of happy customers. 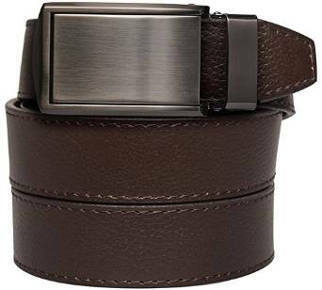 This SlideBelts Men’s Gunmetal Leather Belt has almost the same features as the product above but I wanted to add it to the review because of the gunmetal buckle which makes it even more attractive and stylish. Some of the colors look very nice with this type of buckle and give it an exclusive sleek look. I must also say I was a little shocked by the price but when you go into all of its features and see the style, it doesn´t look that expensive. 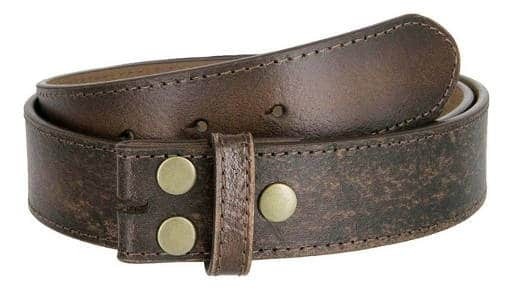 The Men’s Vintage Look Distressed Leather Belt is 1.5″ wide with bonded leather and made with snaps for changing buckles. The just “snap on” and “snap off” is a convenient feature. I was also attracted to this product because there are not that many belts in white color and golfers often need to buy a white belt. It is available at a great price and taking into consideration the very positive reviews, people seem to like it a lot. In conclusion, these top picks for refreshing your belt selection with a new piece will help you select the best leather belt for men and fully enjoy it. Also, they can be particularly useful for those of you who are looking for a good leather belt to offer as a gift.